Canyon Art now has four distinct products for designing Weaving Patterns. is a weaving application for creating, designing and displaying Weaving drafts and patterns. Weavers create the threading, treadling and tie-up and WeaveIt will display the draft as a drawdown. Handweavers will appreciate the ability to calculate yarn yardage and the number of heddles and view color order. WeaveIt Pro for Mac includes many of advance features that were found in WeaveIt Pro for Windows. These include parallel threading tools for echo weave, block substitutions, finding floats, color n' weave, network drafting, double weave plus all the editing tools found in iWeaveit and WeaveIt Pro for Windows. WeaveIt Pro for Mac can quickly exchange files with iWeaveIt for iPad, iPhone, and Android devices. WeaveIt Pro for Mac requires MacOS 10.11 or greater. iWeaveIt for tablets and phones is available on both the Apple IOS and the Android systems. iWeaveIt app is a basic drawdown program. Weavers can create and edit the threading, treadling and tieup. iWeaveIt reads and writes WIF files. Internet files and emailed files can be imported with only one click. iWeaveIt for iPad/iPhone supports the iCloud interface so you can immediately transfer your files to all your devices that allow iCloud. for creating, designing and displaying Weaving drafts and patterns. Weavers create the threading, treadling and tie-up and WeaveIt will display the draft as a drawdown. Handweavers will appreciate the ability to calculate yarn yardage and the number of heddles. WeaveIt supports Windows 7, Windows 8 and Windows 10. It will also support the older systems of Windows 98/ME/NT4/2000, Windows XP and Windows Vista. WeaveIt is a Win32 application and will NOT run on Windows 10S or Chromebook. WeaveIt Pro is great for someone who likes to create drawdowns or for the person who wants more design capability. Handweavers will love the many design tools available: Block substitution, Double Weave, Fabric Analysis, Taquete and Polychome Design, turning and blending drafts, plus the many means of free-form designing and editing of drafts. 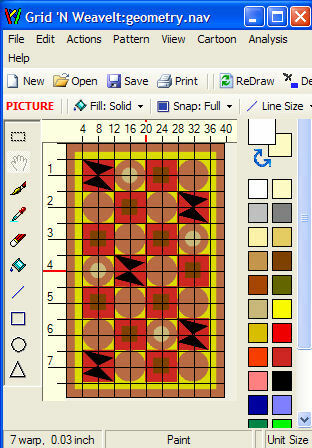 Grid 'N WeaveIt is the link between a graphics paint program and weaving. Paint programs such as Photoshop, Photoshop Elements, Paint Shop Pro or even Windows Paint provide good editing capabilities for creating a graphical picture. However they don’t go the next step needed by weavers. Grid ‘N WeaveIt provides the missing links. 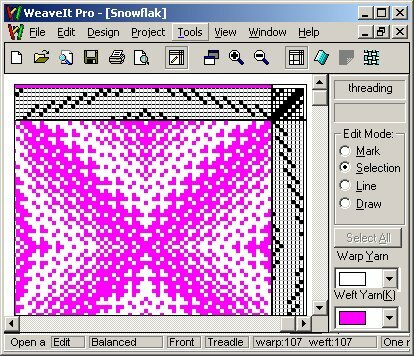 Grid 'N WeaveIt provides basic drawing tools. It allows you to specify the weaving properties of the drawing based on warps and yarns. 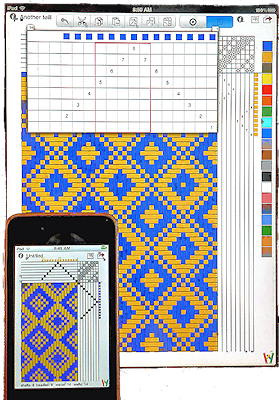 You can create a grid that prints over the drawing to help size your weaving. For tapestry, create and print a separate layer as a cartoon. 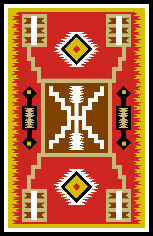 For navajo weaving, create motifs to re-use repeatedly. Print showing the pairs count. 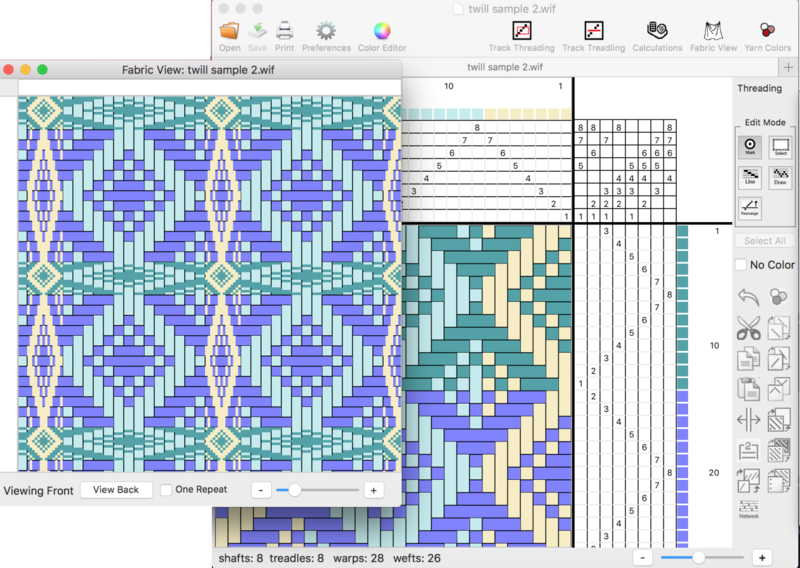 For rug weaving, generate weaving drafts ( WIF) that can be loaded in your WeaveIt program. Use your graphics program in conjunction with Grid 'N WeaveIt to provide advanced graphics editing. Grid 'N WeaveIt will run on Windows 7, Windows 8 and Windows 10. Try out the free demos and order your weaving software soon.